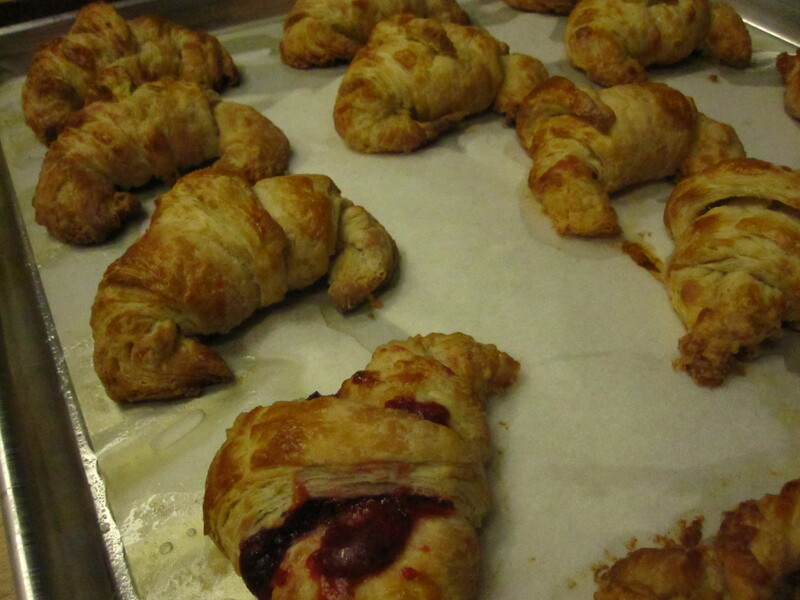 I used to be a croissant junkie. I had to give it up when, well, having them for breakfast made me want to take a nap by 10AM, and frankly I couldn’t find any decent ones around town. So when I was invited to do a croissant baking class at Baker & Nosh in Uptown, I jumped at the chance not only because it’s always been a mystery to me how one achieves the perfectly flaky, buttery texture of the French delicacy, and it had been so damn long since I’d had one, I was ready to dive in and learn. The adorable cafe and bakery started offering bread and croissant classes on Monday and Tuesday evenings last year, with pastry chef/owner Bill Millholland leading the buttery, doughy foray into perfectly golden croissants, baguettes and more. Four-to-six students gather around a large wooden table in the back of the cafe, and immediately jump into into mixing and rolling of the dough and butter (an entire, um, pound per batch), in multiple steps that involve rolling, folding, rolling again, flour dusting, folding, rolling, folding repeat. Feeling and rolling the dough gave my laptop-weary fingers a nice respite, even though I learned that my rolling pin maneuvering left little to be desired. Eventually we learned to cut, twist the dough into plain croissants, jam-filled, and used the scraps for pain au chocolat and cinnamon twists. Brushed with a little egg wash, Bill throws them in the oven and monitors the baking until a batch of a dozen golden flaky beauties emerge and are packaged up for you to wow your family or office, or hoard for yourself. Baker & Nosh, 1303 Wilson Ave.
Wow! Love the idea of a croissant making class! Great find! Thanks for sharing…looks delicious!